Vinyl 7' Cottages come equipped with a set of double doors with locking door handle and 2 single windows with screens and shutters. Vinyl 7' Cottages also offer more headroom than standard Cottages with taller walls. The 10' x 12' Vinyl Cottage shown features pearl vinyl siding, white trim, white doors, dark blue shutters and nickel gray lifetime architectural shingles and optional gable vents. Each storage shed is hand-crafted in the United States by expert Amish woodworkers and finished to order with your choice of siding color, corner trim color and roof shingle color. Our Vinyl 7' Cottage sheds are also available in a wide range of sizes from as small as 6 ' by 8' to as large as 14' by 48' and just about every size in between. If you don't see the exact size you need, please contact us for a custom quote. 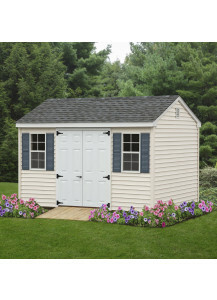 Hand-crafted 8x10 Vinyl 7' Cottage Shed measures 8' by 10' and comes equipped with a set of double doors with locking door handle. 2 single windows with screens and shutters. 8’ wide sheds have a 4’6” door opening, 10’ wide sheds have a 5’door opening, and 12’ wide sheds have a 6’door opening. Doors and windows can be placed according to customer’s request. Cottage models feature 83" walls, 5/12 roof pitch, 18" x 27" windows, shutters and lifetime architectural shingles. Take this home for only $206.53 with a 36-month Rental Agreement from BLI Rent To Own, based on an initial purchase price of $2,707.00. Your initial payment of $206.53 includes a security deposit of 81.21 and your first month's rental payment of $125.32. The estimated monthly payment does not include delivery charges. Ask about 90 days same as cash! Model shown in photo measures 10' x 12' and is finished with pearl vinyl siding, white trim, white doors, dark blue shutters and nickel gray lifetime architectural shingles and optional gable vents. Hand-crafted 8x12 Vinyl 7' Cottage Shed measures 8' by 12' and comes equipped with a set of double doors with locking door handle. 2 single windows with screens and shutters. 8’ wide sheds have a 4’6” door opening, 10’ wide sheds have a 5’door opening, and 12’ wide sheds have a 6’door opening. Doors and windows can be placed according to customer’s request. Cottage models feature 83" walls, 5/12 roof pitch, 18" x 27" windows, shutters and lifetime architectural shingles. Take this home for only $226.14 with a 36-month Rental Agreement from BLI Rent To Own, based on an initial purchase price of $2,964.00. Your initial payment of $226.14 includes a security deposit of 88.92 and your first month's rental payment of $137.22. The estimated monthly payment does not include delivery charges. Ask about 90 days same as cash! Hand-crafted 10x10 Vinyl 7' Cottage Shed measures 10' by 10' and comes equipped with a set of double doors with locking door handle. 2 single windows with screens and shutters. 8’ wide sheds have a 4’6” door opening, 10’ wide sheds have a 5’door opening, and 12’ wide sheds have a 6’door opening. Doors and windows can be placed according to customer’s request. Cottage models feature 83" walls, 5/12 roof pitch, 18" x 27" windows, shutters and lifetime architectural shingles. Take this home for only $251.85 with a 36-month Rental Agreement from BLI Rent To Own, based on an initial purchase price of $3,301.00. Your initial payment of $251.85 includes a security deposit of 99.03 and your first month's rental payment of $152.82. The estimated monthly payment does not include delivery charges. Ask about 90 days same as cash! Hand-crafted 10x12 Vinyl 7' Cottage Shed measures 10' by 12' and comes equipped with a set of double doors with locking door handle. 2 single windows with screens and shutters. 8’ wide sheds have a 4’6” door opening, 10’ wide sheds have a 5’door opening, and 12’ wide sheds have a 6’door opening. Doors and windows can be placed according to customer’s request. Cottage models feature 83" walls, 5/12 roof pitch, 18" x 27" windows, shutters and lifetime architectural shingles. Take this home for only $273.90 with a 36-month Rental Agreement from BLI Rent To Own, based on an initial purchase price of $3,590.00. Your initial payment of $273.90 includes a security deposit of 107.70 and your first month's rental payment of $166.20. The estimated monthly payment does not include delivery charges. Ask about 90 days same as cash! Hand-crafted 10x14 Vinyl 7' Cottage Shed measures 10' by 14' and comes equipped with a set of double doors with locking door handle. 2 single windows with screens and shutters. 8’ wide sheds have a 4’6” door opening, 10’ wide sheds have a 5’door opening, and 12’ wide sheds have a 6’door opening. Doors and windows can be placed according to customer’s request. Cottage models feature 83" walls, 5/12 roof pitch, 18" x 27" windows, shutters and lifetime architectural shingles. Take this home for only $296.79 with a 36-month Rental Agreement from BLI Rent To Own, based on an initial purchase price of $3,890.00. Your initial payment of $296.79 includes a security deposit of 116.70 and your first month's rental payment of $180.09. The estimated monthly payment does not include delivery charges. Ask about 90 days same as cash! Hand-crafted 10x16 Vinyl 7' Cottage Shed measures 10' by 16' and comes equipped with a set of double doors with locking door handle. 2 single windows with screens and shutters. 8’ wide sheds have a 4’6” door opening, 10’ wide sheds have a 5’door opening, and 12’ wide sheds have a 6’door opening. Doors and windows can be placed according to customer’s request. Cottage models feature 83" walls, 5/12 roof pitch, 18" x 27" windows, shutters and lifetime architectural shingles. Take this home for only $320.90 with a 36-month Rental Agreement from BLI Rent To Own, based on an initial purchase price of $4,206.00. Your initial payment of $320.90 includes a security deposit of 126.18 and your first month's rental payment of $194.72. The estimated monthly payment does not include delivery charges. Ask about 90 days same as cash! Hand-crafted 12x12 Vinyl 7' Cottage Shed measures 12' by 12' and comes equipped with a set of double doors with locking door handle. 2 single windows with screens and shutters. 8’ wide sheds have a 4’6” door opening, 10’ wide sheds have a 5’door opening, and 12’ wide sheds have a 6’door opening. Doors and windows can be placed according to customer’s request. Cottage models feature 83" walls, 5/12 roof pitch, 18" x 27" windows, shutters and lifetime architectural shingles. Take this home for only $332.19 with a 36-month Rental Agreement from BLI Rent To Own, based on an initial purchase price of $4,354.00. Your initial payment of $332.19 includes a security deposit of 130.62 and your first month's rental payment of $201.57. The estimated monthly payment does not include delivery charges. Ask about 90 days same as cash! Hand-crafted 12x14 Vinyl 7' Cottage Shed measures 12' by 14' and comes equipped with a set of double doors with locking door handle. 2 single windows with screens and shutters. 8’ wide sheds have a 4’6” door opening, 10’ wide sheds have a 5’door opening, and 12’ wide sheds have a 6’door opening. Doors and windows can be placed according to customer’s request. Cottage models feature 83" walls, 5/12 roof pitch, 18" x 27" windows, shutters and lifetime architectural shingles. Take this home for only $353.25 with a 36-month Rental Agreement from BLI Rent To Own, based on an initial purchase price of $4,630.00. Your initial payment of $353.25 includes a security deposit of 138.90 and your first month's rental payment of $214.35. The estimated monthly payment does not include delivery charges. Ask about 90 days same as cash! Hand-crafted 12x16 Vinyl 7' Cottage Shed measures 12' by 16' and comes equipped with a set of double doors with locking door handle. 2 single windows with screens and shutters. 8’ wide sheds have a 4’6” door opening, 10’ wide sheds have a 5’door opening, and 12’ wide sheds have a 6’door opening. Doors and windows can be placed according to customer’s request. Cottage models feature 83" walls, 5/12 roof pitch, 18" x 27" windows, shutters and lifetime architectural shingles. Take this home for only $378.89 with a 36-month Rental Agreement from BLI Rent To Own, based on an initial purchase price of $4,966.00. Your initial payment of $378.89 includes a security deposit of 148.98 and your first month's rental payment of $229.91. The estimated monthly payment does not include delivery charges. Ask about 90 days same as cash! 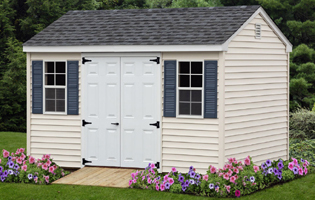 Hand-crafted Vinyl 7' Cottage Shed measures 12' by 20' and comes equipped with a set of double doors with locking door handle. 2 single windows with screens and shutters. 8’ wide sheds have a 4’6” door opening, 10’ wide sheds have a 5’door opening, and 12’ wide sheds have a 6’door opening. Doors and windows can be placed according to customer’s request. Cottage models feature 83" walls, 5/12 roof pitch, 18" x 27" windows, shutters and lifetime architectural shingles. Take this home for only $435.50 with a 36-month Rental Agreement from BLI Rent To Own, based on an initial purchase price of $5,708.00. Your initial payment of $435.50 includes a security deposit of 171.24 and your first month's rental payment of $264.26. The estimated monthly payment does not include delivery charges. Ask about 90 days same as cash!